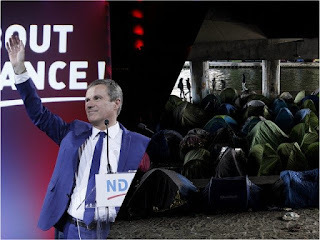 French conservative politician Nicholas Dupont-Aignan, who gave his support to anti-mass migration presidential candidate Marine Le Pen last year, has been given a suspended fine of 5,000 euros for speaking about a “migrant invasion”. On Wednesday, a court in Paris found the conservative guilty of provocation to hatred or discrimination with a suspended 5,000 euro fine being handed down. The case was brought to the court by the International League Against Racism and Anti-Semitism (Licra) which claimed Dupont-Aignan’s parliamentary immunity should not apply in the case. “We have a leading politician, declared candidate for the presidential election, who quietly takes, publicly, on his own account a conspiracy and racist theory born in the depths of the French far right at the beginning of the previous decade,” the prosecutor in the case said. The “racist theory” the prosecutor mentioned is the theory of the “Great Replacement” coined by prolific French author Renaud Camus who has railed against mass migration for years. Roman Catholic Archbishop of Strasbourg Luc Ravel also invoked the term last July stating: “Muslim believers know very well that their birthrate is such that today, they call it … the Great Replacement, they tell you in a very calm, very positive way that, ‘one day all this, it will be ours.’”…….